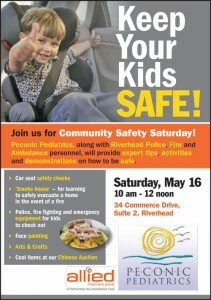 Peconic Pediatrics, along with the Riverhead Police, Fire and Ambulance personnel, provide expert tips, activities and demonstrations on how to be safe. Face painting and arts & crafts are available for children. Chinese Auction prizes will include two one-month memberships to Maximus Fitness, a fitness basket with 5 personal training sessions, a nutrition basket that will include a free consultation with a registered dietitian, 4 tickets to a Long Island Ducks game and more! All proceeds will benefit Riverhead Police, Fire and Ambulance departments.